Barry Bonds, baseball's single-season and all-time home run leader, is one of the most contentious players in the modern game. And yet, Barry Bonds cards, especially his earliest options, are a worthy addition to any personal collection. Look back at key cardboard for Bonds, including his most popular rookie cards and more recent autographs. Bonds was born into baseball royalty as his father Bobby Bonds held the record for the most 30/30 seasons (home runs and stolen bases) and his godfather was the legendary Willie Mays. With a career longevity and consistency rivaling that of Hank Aaron, Bonds hit 30 or more home runs for 13 consecutive seasons between 1992 and 2004. His seven MVP awards, won while playing for both the Pittsburgh Pirates and San Francisco Giants, is an unprecedented record. Statistically speaking, very few other players are more deserving of a trip to Cooperstown. However, the steroid scandal that haunted the latter part of his career added an asterisk to his legacy and has kept the Hall of Fame waiting. Shop for Barry Bonds autograph cards on eBay. Even so, Barry Bonds baseball cards remain very popular, especially those with limited print runs, such as the Refractors found in 1997 and 1998 Topps Finest or the Precious Metals inserts in 1998 Donruss Preferred. 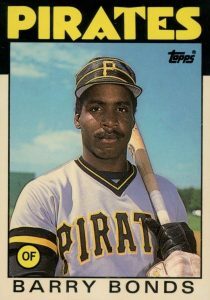 While several of Barry Bonds' rookie cards make the list, additional options include 1986 Sportflics Rookies, 1987 Classic Update Yellow Travel Edition, and the 1987 Topps Toys R Us Rookies set. 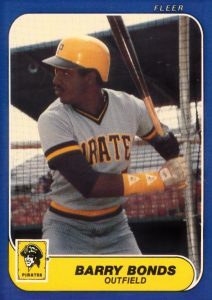 It is important to point out that many collectors typically assign the "rookie card" designation to both the 1986 update sets and his first appearances in the various 1987 flagship sets. As his popularity surged, Bonds became the first player to withdraw himself from the MLB Player Association licensing agreement. This meant that the baseball card makers had to work out contracts with Bonds directly to be included in their sets. Therefore, the number of cards produced fell greatly near the end of his career and after he retired. Although card value is the main determining factor for inclusion on the list, a focus was placed on baseball cards from the beginning of Bonds' career. Buy cards on eBay using the listings below. Links in the descriptions go directly to set profiles. One of the lesser-known Bonds rookie cards can be found in the tiny 1987 Fleer Baseball's Hottest Stars set that was made exclusively for the Revco pharmacy chain. The red, white and blue border makes the card one of my personal favorites for Bonds. Of course, he is the highlight of the 44-card release. Sold as a complete set in a small paper box, collectors also received six team logo stickers. The competition between Fleer Glossy and Topps Tiffany started in 1987 with the release of Fleer's first premium set. The glossy cards became the top version for Fleer collectors because of the more limited print run and higher quality product. It is estimated that 100,000 glossy sets were created, making the production about three times as plentiful as the Tiffany version. 1987 Donruss Opening Day was true to its name as it featured the starting lineups for all 26 teams to begin the year. 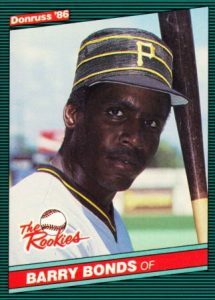 The 1987 Donruss offshoot set in and of itself isn't too interesting, with one major exception: a notable Barry Bonds error card. 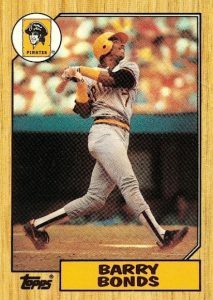 When Donruss initially released card #163, the card attributed to Bonds actually featured Pirates second baseman Johnny Ray. Because Bonds was one of the top up-and-coming players in the league, the error was quickly fixed and reissued. As a result, not many of the error cards made it onto the secondary market. The Ray/Bonds error card often surpasses other Barry Bonds rookies at auction because of its scarcity but it can only climb so far on this list since it just features Bonds by name. For nearly a decade after Bonds quit playing in 2007, he was nowhere to be found in MLB card sets. With the controversy surrounding the steroid scandals, Bonds was considered "persona non grata" for some collectors, and baseball management, as well. Time seems to have healed the wounds to an extent, and Barry Bonds autographs began appearing again in 2016 Topps Five Star. The trend continued in several 2017 products like this beautiful appearance in 2017 Topps Gypsy Queen. He also has signed Topps cards in 2017 Finest, 2017 Tier One and 2017 Tribute. 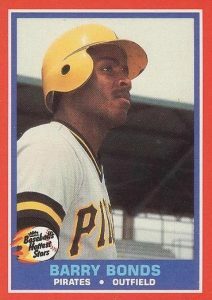 The first Barry Bonds rookie card featured from the 1986 expansion sets comes in 1986 Fleer Update. 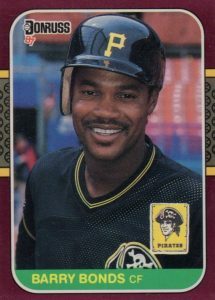 The deep blue border accents the bright yellow of the Pirates jersey colors nicely to make for an interesting-looking card. The 132-card factory set remains one of the least expensive options for Bonds' rookie collectors. Members of the 1992 All-Star teams were given the "Baseball's Finest All-Stars" designation in the premiere edition of Topps Finest. After winning his second MVP award in 1992, Bonds led the league with 46 home runs the following year. As we all know, he would go on to hit more homers than any other player in baseball history, but he would only top the league in home runs one other time. This came in 2001 when he hit 73 home runs to set the single-season record. 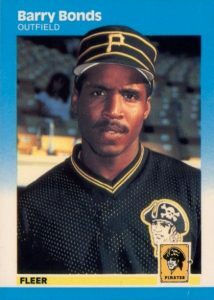 Bonds' 1986 Donruss The Rookies card features him wearing the three-striped Pirates cap which was made famous during the "We Are Family" World Series-winning Pirates team of the late 1970s. In 1987, the team would stop using that hat design all together. Speaking of changing designs, The Rookies expansion set borrowed the 1986 Donruss design but swapped the blue scheme for a green one. 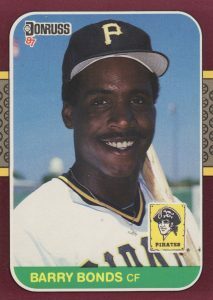 The Barry Bonds rookie card is by far the most valuable in the 56-card set. 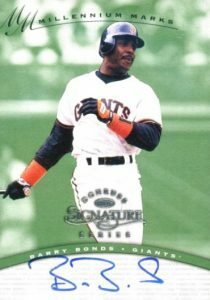 Although it is not his first certified autograph card, 1997 and 1998 Donruss Signature Series offers some of the most important Barry Bonds autographs from his earlier years. While he previously had autographs in 1993 Classics, they were not of very good quality. Today, the 1997 Donruss Signature edition on the left is more elusive than 1998 (on the right) but neither is plentiful. 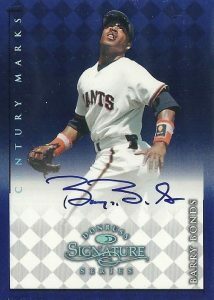 Bonds only signed for the Millennium Marks (400 copies) and Century Marks (100 copies) parallels in each set. 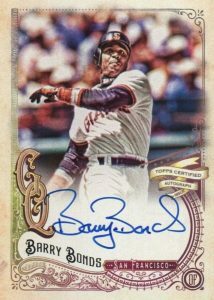 Barry's signature can vary slightly in that some autographs have almost every letter of his name clearly legible while most others tend to focus on the "B" in Barry and the "B" and "S" in Bonds. The popularity of Topps products over all other card makers is made clear given that Bond's 1987 Topps card outperforms his 1986 debuts in the Donruss and Fleer sets. Production of the Tiffany version sits at about 30,000 sets, making the limited-edition release the preferred card to collect. Barry's rookie season saw him lead National League rookies in home runs, RBI, and stolen bases, but he only finished sixth in Rookie of the Year voting, falling well behind St. Louis Cardinals reliever and ROY winner, Todd Worrell. 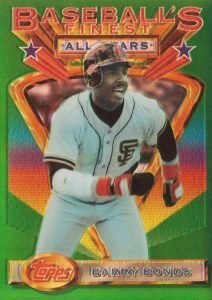 Along with Mark McGwire's 1985 Topps U.S. Olympic team rookie card and Ken Griffey Jr.'s 1989 Upper Deck rookie, the Barry Bonds rookie card in 1986 Topps Traded Tiffany is a clear highlight among the top baseball cards of the 1980s. It is estimated that only 5,000 Tiffany versions were created for the '86 Topps Traded set. Based on the supply, it seem that nearly all have been graded and made available on the secondary market. At auction, gem-mint graded copies have surpassed an amazing $1,700.